Based on years of research, Sydney Finkelstein, professor at Tuck School of Business at Dartmouth and author of Why Smart Executives Fail, looks at how a select few visionaries develop the most successful talent in every industryAfter meeting chef Alice Waters at her legendary restaurant, Chez Panisse, Sydney Finkelstein got to thinking about the dozens of chefs who had come from her establishment to open their own restaurants and gain notoriety as some of the country's most creative culinary figures. Waters, he found, had spawned a family tree of geniuses. Could this pattern exist in other industries?After years of research, Finkelstein found that similarly powerful mentors did indeed exist across every industry from finance to entertainment to fashion and the arts, and that they created a network of superstars in their community, using techniques that are varied and often counterintuitive.Finkelstein profiles luminaries such as Waters, Lorne Michaels, Miles Davis, Ralph Lauren, Larry Ellison, and Bonnie Fuller.Drawing on fascinating first person accounts and surprising best practices, Finkelstein explores a phenomenon that has never been researched before, and explains how any leader can create a powerful network and nurture extraordinary talent. its my 1st boss/ leadership book. i have learned alot. 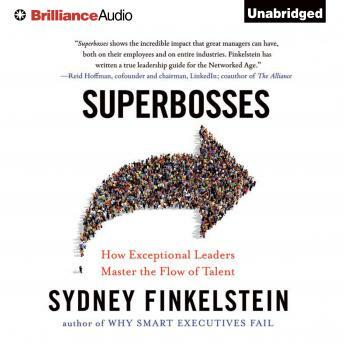 this book gives plenty of example of great bosses, great techniques and even how to find a superboss while you're on the job hunt. i enjoyed this book. A must read for anyone who manages a team. Teaches you how to not only be successful but a great boss. Lead your team to not only meet goals but build an army of leaders that can surpass goals.